A group of a dozen migrants were arrested Monday night after stealing a fishing boat from the French port of Boulogne-sur-Mer and managing to reach the UK coast. The theft occurred in the Pas-de-Calais department, the closest French department to the British coast, at around 9:30 pm Monday night. They were intercepted and arrested by the UK Border Force at around 1 am Tuesday at Dover harbour in Kent, Le Parisien reports. French authorities labelled the incident “unprecedented” saying that they immediately alerted UK border authorities after noticing that a fishing vessel had taken a highly unusual course from Boulogne-sur-Mer across the English Channel. 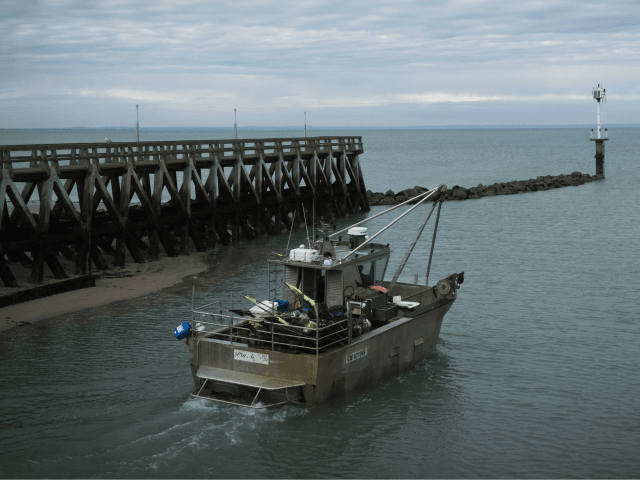 The Regional Operational Centre for Surveillance and Rescue at the cape of Gris-Nez then called the owner of the fishing boat who reported to them that his vessel had been stolen. A UK Home Office spokesman said: “Border Force attended a report of a fishing vessel at Dover Harbour this morning, Tuesday 13 November, and boarded it with assistance from Dover Harbour Authorities and HM Coastguard. The maritime prefecture claimed that the number of migrants intercepted attempting to cross the channel had increased with 23 so far in 2018, more than double the 12 interceptions of 2017 and on par with the 23 in 2016. Migrants in the Calais region have been attempting to cross the channel for several years, and in some cases have succeeded, as was the case in April of 2016 when two Iranians were able to land in Kent after being picked up by lifeguards. Earlier this year, it was revealed that people smugglers were using speedboats to smuggle Albanian migrants across the channel. Six men, a mix of Albanians and British, were convicted of attempting to smuggle illegal migrants for as much as £6,000 per person. Despite the evacuation of the Calais migrant camp in 2016, many asylum seekers still remain in Calais, nearby Dunkirk, and several coastal Belgian towns attempting to sneak on to ferries headed to the UK.